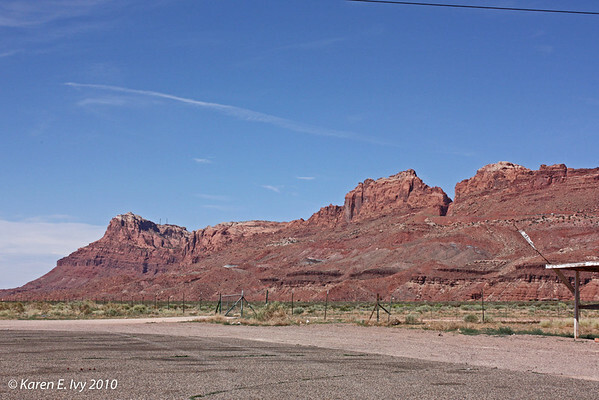 After we left Monument Valley, which we detoured to see, we drove more or less straight to the Grand Canyon, through the Vermilion Cliffs and over the Colorado River at Lee's Ferry, just below the Glen Canyon Dam. Here are the Vermilion Cliffs. The notch you see in the cliffs, about a third of the way in from the right, is where the road comes through. And goes down. We saw two California Condors, hovering over the bridge about 100 feet up. I didn't get a photo (drat). My husband did. This trip involves a lot of driving through a lot of nowhere, but God, is it beautiful nowhere. Driving through the Red Desert is a cure for any feeling of self-importance you may have. Or security. If you break down out there it'll take a long time for the rescue crew to find you – although there's pretty steady traffic along the road. Cell phone coverage, not so much. At Lee's Ferry the altitude was approximately 3,700 feet, and the temperature was 103º. The Lodge on the North Rim is at 8,255 feet and the temperature was 74º. About 2 hours apart. 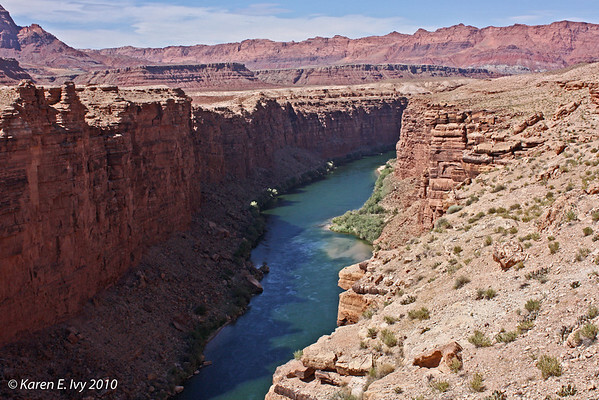 I'd been to the Grand Canyon before but had never actually seen the place. When I was about 14, my parents took us on a Camping Trip to see the great national parks: Lehman Caves, Bryce, Zion, and the Grand Canyon. That was the trip the family car vaporlocked (if you're old enough you know what that was) crossing Nevada; which caused us to stop a couple of days in Salt Lake City while my dad bought a length of copper pipe and rerouted the fuel line away from the exhaust manifold. Somewhere there is a photo of dad, standing in the desert next to the motionless car, looking disgusted. Only my dad would interrupt a vacation to rebuild the car. By the time we got to the Grand Canyon, last stop on the trip, we were all pretty tired. We pulled into a campground at the South Rim around 5 in the evening and started to pitch the tent – and then it began to rain. We'd been running from the thunderstorm since we left Zion and it had caught up with us. So we struck the tent and stuffed everything back into the top carrier (homemade of 1×4 oak boards, but that's another story) and hit the road. That trip was one of the few times in my life where we actually had to stop the car because it was raining so hard. The windshield wipers on that car simply couldn't keep up. 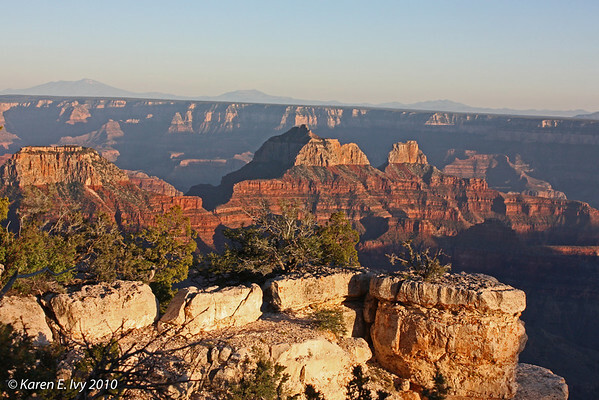 So I never did see the Grand Canyon on that trip, and it took me fifty years to get back. In a better car. There's one more footnote to that camping trip. We were all sleeping on air mattresses. In the scramble to repack in the rain, two of the mattresses got pinched. We discovered this around 1 AM, in a campground in Las Vegas, during a dry thunderstorm – my mother and I woke up on the ground. That was the point at which mother decided we had camped enough – the rest of the trip home we stayed in motels! 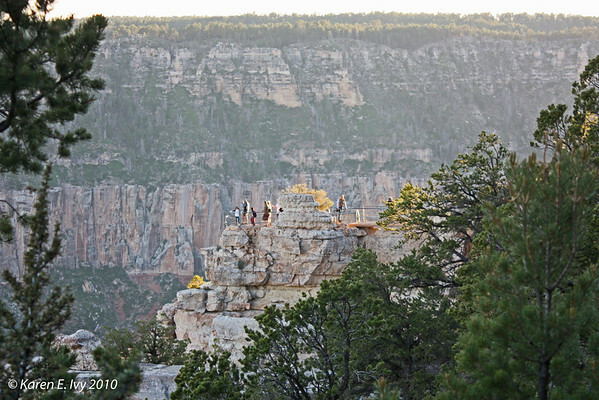 The rest of these photos are in the gallery To The North Rim. The earlier posts on this vacation are at Hedera's Corner under 2010 Vacation.